Productivity, practicality, and creating a purpose have all come together under one mini mansion roof. For the criminals in Nottingham and Bradford, it is a unique probationary opportunity. And for the strays, it is a home. With some twenty groups involved, including a football league, suffice to say those in the Community Payback scheme are unique. As part of their probation program, criminals are building mini mansions for stray cats. Their efforts will go far to keep these homeless cats safe and warm throughout the community. With over 2,000 strays in the region, this work can have an immense impact on their well-being. Beginning with a polystyrene box, the piece is inserted into a plastic container. 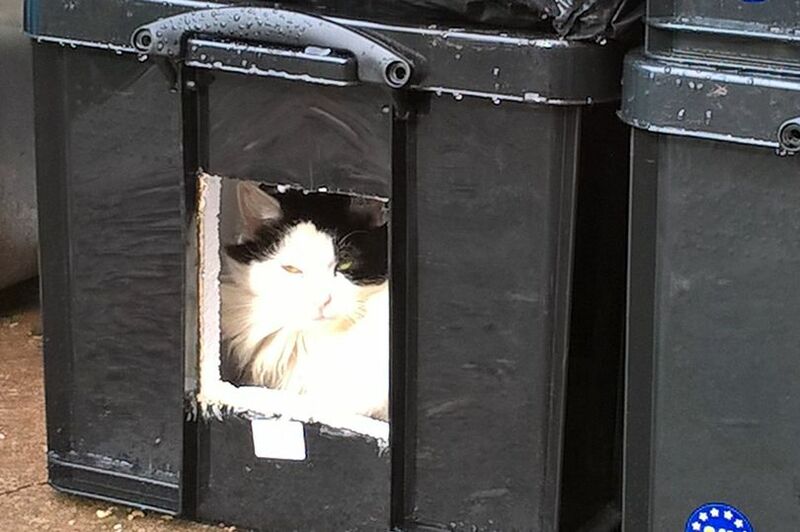 Doors are then cut into the sides allowing the felines access to their new accommodations. The program participants then place a bed of straw into the interior, creating a cozy environment. This project is part of a Cat Census conducted by the UK’s largest cat charities, Cats Protection. This novel, first-ever program both tracks and helps house the many stray cats living on the streets. “It is possibly the most unusual job we have done – building homes for stray cats,” said Allan Fitzsimmons, placement co-ordinator at West Yorkshire ­Community Rehabilitation Company. While it is the stray population in this region that is currently part of the program, Cats Protection believes felines number nine million across the country. That is an extraordinary number of homeless felines. Even though cats can adapt to life on the street, it is very difficult for them and the hope is these mini mansions will make a difference. But construction of mini mansions is only one part of the program. The Liverpool Vet School is conduction free spaying and neutering in an effort to keep the stray population down. What a wonderful idea, I am sure they appreciate it.